All 92 people on board a Russian military aircraft are feared dead after it crashed into the Black Sea. The plane disappeared from radar two minutes after taking off from Sochi at 05:25 (02:25 GMT), heading for Latakia in Syria, the defence ministry said. Debris and 11 bodies have been found, with no reports of survivors. The Tu-154 was carrying soldiers, reporters and 64 members of the famed Alexandrov military music ensemble who were to perform for Russian troops. 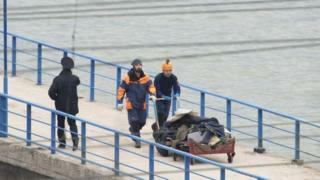 More than 100 divers are involved in a round-the-clock search operation at the site of the crash, Russia's defence ministry says. Russia's transport minister says investigators are looking into an "entire spectrum'' of possible reasons the crash occurred, including the possibility of a terror attack. Earlier, a Russian official had downplayed any suggestion of a terror attack. President Vladimir Putin has said Monday will be a day of national mourning. The flight had originated in Moscow and landed at Adler airport in Sochi for refuelling. The defence ministry said in a statement: "Fragments of the Tu-154 plane of the Russian defence ministry were found 1.5km (one mile) from the Black Sea coast of the city of Sochi at a depth of 50 to 70m (165-230ft)." Ministry spokesman Maj-Gen Igor Konashenkov said: "No survivors have been spotted." What is the Alexandrov Ensemble? An audio recording played on Russian media and said to be of the final conversation between air traffic controllers and the plane reveals no sign of any difficulties being faced by the crew. Voices remain calm until the plane disappears and the controllers try in vain to re-establish contact. Reports from the area said flying conditions were favourable. Gen Konashenkov said the plane was last serviced in September and had undergone more substantial repairs in December 2014. It had an "experienced" pilot. President Putin has ordered a state commission to look into the crash and sent his condolences to the families and friends of the victims. The defence ministry has published a passenger list (in Russian), showing that 64 of those on board were from the Alexandrov Ensemble, including its director, Valery Khalilov. There were nine journalists, eight soldiers, two civil servants and eight crew members. Also on board was Elizaveta Glinka, known as Dr Liza, the executive director of the Fair Aid charity and the inaugural winner of Russia's state prize for achievements in human rights. The Alexandrov Ensemble was scheduled to perform a New Year's concert at Russia's Hmeimim air base near Latakia. Russia has been carrying out air strikes in support of Syrian government forces who are battling rebels opposed to Syrian President Bashar al-Assad. In April 2010, a Tu-154 plane crashed in Smolensk, western Russia, killing all 96 people on board, including Polish President Lech Kaczynski. A Tu-154, operated by Siberian Airlines, was shot down over the Black Sea in October 2001, killing 78 people. The plane was travelling from Tel Aviv in Israel to Novosibirsk in Russia, and most of the passengers were Israeli. The Ukrainian military initially denied involvement but officials later admitted the plane could have been hit accidentally during a training exercise.